This is the "box" that holds all of the d20 System Products that are compatible with D&D 3.0 and any other d20 RPG of that era. 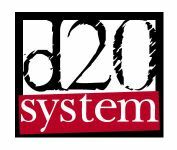 We have other boxes for 3.5 and 4th edition d20 System Products. Products not bearing the official logo of Dungeons & Dragons from WotC should go in one of these "d20 System Products" boxes rather than the D&D boxes.